What is meant by "hip dislocation"? The hip is a simple "ball and socket" joint that has a wide range of movement in all directions and its efficient function is essential to normal hind limb movement. The joint itself is comprised of the acetabulum which is a cup shaped depression in the pelvis (this forms the "socket") and the femoral head which is part of the femur (thighbone). The femoral head forms the "ball" of the "ball and socket" joint. "The most common cause of hip dislocation is blunt force trauma..."
The stability of the hip joint comes from the joint capsule, a short ligament that connects the ball to the socket and the muscles that surround the hip. When the hip dislocates, the "ball" is displaced from the socket ("out of socket"); in most cases, the femoral head will be positioned above and in front of the acetabulum. The most common cause of hip dislocation is blunt force trauma such as a fall or an automobile injury, but any traumatic injury to the hip area may cause a hip dislocation. An increasing number of cats, especially pure-breed cats, are being diagnosed with hip dysplasia (poor hip joint conformation) similar to that seen in dogs. Hip dysplasia may predispose an individual cat to hip dislocation. What are the clinical signs of a dislocated hip? With some traumatic injuries, your cat may have been missing from home for a few days because it may have had difficulty returning home. In addition to having a dislocated hip, there may also be other injuries, some of which may be more serious. Most cats with a hip dislocation will have severe hind limb lameness and may not be able to put any weight on the affected limb. The affected limb is often carried in a flexed (folded or pulled up) position with the knee joint rotated inwards towards the cat's body. In some cases, the affected limb may be rotated so far inwards that it crosses over in front of the uninjured limb. How is a hip dislocation diagnosed? The hip joint will be painful when your veterinarian manipulates it during the physical examination of your cat. In addition to this, your veterinarian may feel a grinding sensation when the femur is moved.
" A diagnostic x-ray will show the direction of dislocation, and whether a fracture of any part of the hip joint has occurred." A comparison of the lengths of both hind limbs will often reveal that the affected limb is apparently shorter. The diagnosis is confirmed by a radiograph or x-ray. A diagnostic x-ray will show the direction of dislocation, and whether a fracture of any part of the hip joint has occurred. If a fracture is present, it may be more difficult to repair the dislocation. If your cat has other, more serious or life-threatening injuries, these will be treated before your veterinarian will even consider addressing the dislocated hip. What is the best treatment for a dislocated hip? In most cases of hip dislocation, it is desirable to replace the "ball" in the "socket". The only time when it may be reasonable not to do this is if your cat has some other illness or if there are other factors that make anesthesia too risky to undertake. If the hip is left dislocated, a "false joint" will form, but the cat will have a permanent lameness. "The success of a closed reduction increases if the dislocation is recent..."
In many cases, it is possible to replace the ball in the socket by manipulation under general anesthesia (closed reduction). The success of a closed reduction increases if the dislocation is recent (i.e. the injury is less than 72 hours old). After the dislocation is "reduced" or replaced, a supportive wrap or bandage will be applied to immobilize the leg and prevent the hip from re­-luxating ("popping back out"). This bandage or support wrap will remain in place for 4 to 14 days. The occasional cat may not tolerate this bandage well. The cat must be closely supervised and its activity must be severely restricted to ensure that the bandage is not too tight and is not causing damage to the cat's leg or that the cat is too distressed by the support wrap. In some cases of hip dislocation, either it will be impossible to replace the "ball" in the "socket" or the "ball" will keep slipping out of the "socket.". In these cases, an operation is indicated to repair the injury. The specific surgical repair technique will depend on the nature of the injury and the preference of the veterinary surgeon. What post-operative care does my cat need? If it has been possible to replace the femoral head back into the acetabulum without surgery, your cat will most likely be prescribed a short course of pain relief medications to be administered by mouth. "...your cat will need to be confined to strict cage rest. " In addition to this, your cat will need to be confined to strict cage rest. 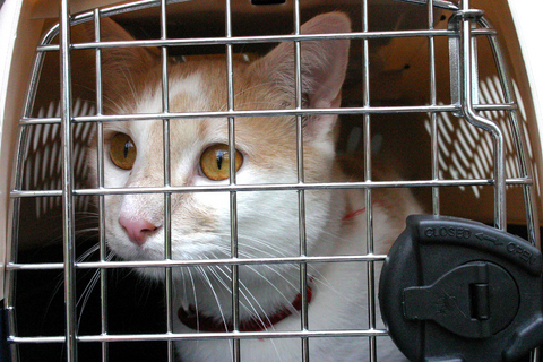 Your cat will have to be confined in this way for three to four weeks before it is safe to allow unrestricted activity. During this time, your cat may have a bandage on the affected leg, which should be carefully inspected daily to make sure that there are no problems with it. Your veterinarian will give you specific instructions for the care and monitoring of any bandages that were placed. In cases that have had an operation, painkillers and antibiotics will normally be administered. It will be necessary to confine your cat as directed by your veterinarian. This is usually for a period of three to four weeks. At this point, it may be necessary to have sedation or a second operation to remove any pins that have been used in the repair. What is the long-term prognosis for my cat? If the femoral head ("ball") has been successfully replaced and the correct post-operative treatment has been adhered to, it is unlikely that the hip will re-dislocate. In many cases, the hip joint will regain full function and will require no further treatment. However, some cats may develop a stiff or arthritic hip months or years after the dislocation, and this may require additional treatment. Cats that were unable to have the joint successfully replaced will often limp or have limited use of the limb. Most of these cases will eventually require treatment for osteoarthritis due to their injury.